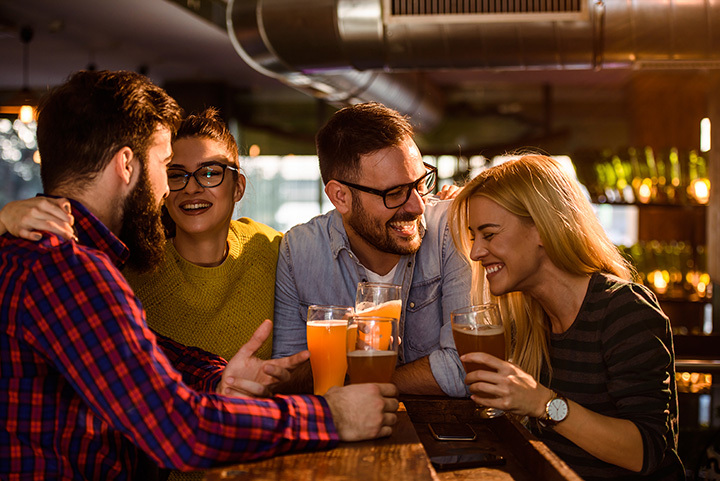 Local bars bring people together in a common goal…socializing in a place that feels like home. Quite often, the bars are landmarks in town with a rich history that makes them more than just a watering hole. Grab a stool at any one of these 10 bars for an unforgettable experience. In its heyday, this bar was a hangout for bikers. Now it’s a hangout for just about anyone looking for a downtown watering hole. Situated right next to the town’s historic Penny Arcade, this well-worn bar may be small, but the drinks pack a wallop. Full bar and beers on tap, a pool table, patio and juke box that plays classic rock favorites makes this a favorite spot for locals who welcome visitors. Don’t miss the dog mural. This bar got the greenlight to open in 1933 and bills itself as the city’s original drinking establishment. It’s still family-owned eighty-plus years later. It’s morphed into more than just a bar and now hosts fun nights, activities, live music, drink and Panic Hour specials on well drinks, domestic beer and bombs. It’s a place of history from its location in a former bank building to the memorabilia on the walls. Known for having the “Best happy hour in Jefferson County,” this bar, a landmark in town, has been operating for more than 50 years. Maybe because it has two happy hours a day, 7 to 11 a.m. and 3 to 7 p.m. It’s been a favorite for late-night shift workers and opens early with a special drinks menu for the overnight crew. Karaoke on Friday and Saturday, a pool table, bowling game and jukebox keeps the place hopping. With a slogan, “Tiny Tavern, Big on Bull,” this bar is pretty uncomplicated. The beer is cold. The pit-smoked barbecue is packed with flavor. The full bar is well-stocked for the creative cocktail crowd. There’s an outdoor bar, patio and beer garden with a beautiful view that’s comfortable any time of year. It’s open into the wee hours of the morning…a good pitstop for a late-night meal or just to hook up with friends. Coors on tap. You’ll absolutely hit the mother lode at this unpretentious family-owned, rustic bar that’s been a mainstay in town since the 1970s—cold beer, full bar, pool table, video games and amazing burger, the Mother Lode, ham, bacon, mushroom sauce, American and Swiss cheese and a pile of other fresh ingredients. A hole-in-the-wall with a down-home atmosphere and a good mix of local and regional beer. This historic bar, the city’s oldest jazz and blues club opened in 1933, the day after prohibition ended. It’s had a who’s who of legendary musicians perform on its tiny stage. It’s funky and old, but the “Pec” as it’s known has staying power thanks to a loyal customer base that wants what it offers—an authentic, low key atmosphere, amazing music and homemade Mexican fare that hits the spot. This tiny, tiny tavern packs a wallop with some specialties only found at this, the town’s oldest bar. Don’t miss the Jell-O shots or the toxic cherries and oranges or the apple pie flavor moonshine or the Town Pump Pale Ales only found here. The interior is adorned with funky signs and stickers plastered on the walls. The ebb and flow of intriguing characters wandering in and out of this local watering-hole is riveting. Full bar, lots of beer, cash only. Known as “The Downer,” most likely because it’s in a basement, this college student haunt serves PBR beer by the pitcher, cheap Kamikaze shots, an extensive line-up of craft beer and an eclectic selection of bourbon. There are games aplenty—pool, darts, shuffleboard, foosball—that keep the beer flowing and the place packed. A couple of years running, it served more Pabst Blue Ribbon than any other bar in the world. It’s loud, it’s noisy, it gets crazy crowded, but it’s place that welcomes all ages…except under age! What does a Wisconsin native do when he relocates to Colorado? Open a bar that serves Pabst Blue Ribbon, butter burgers and deep-fried cheese curds and tune the TVs to Packers football. Once the NFL season is over, the bar tunes the TVs to a wide-range of sports events. Happy hour happens every day with specials on beer and cheap hot dogs. Live music, trivia contests and other games take place throughout the week. Wearing green and yellow isn’t mandatory at this neighborhood bar, but it might be prudent. Go PACK! Anchoring a corner of Main Street, “The Ranch” has been a favorite spot for locals and visitors for more than 70 years. It’s famous Bloody Mary is the best in town and the food, brought in from the Durango Diner, is all about comfort. The bar is a gleaming wall of bottles filled with liquors of all types. Local micro-brews on tap. Plenty of pool and foosball tables, as well as a bank of TVs for sports fans. Don’t miss the mural of World Heavy Weight Champion Jack Dempsey, a Colorado native. View more Colorado Bars and Saloons.